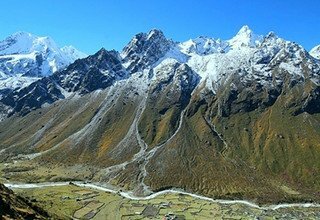 Rolwaling Tashi Lapcha Pass Trek is a striking journey that sums up the beauty of both Rolwaling valley and Khumbu region of Nepal. 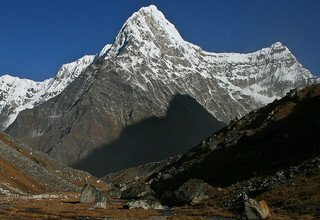 This thrilling and inspiring trek leads you to a faraway location and lets you acknowledge the lovely views of the Himalayas with the difficulties of crossing the high-mountain pass of Tashi Lapcha (5755m). 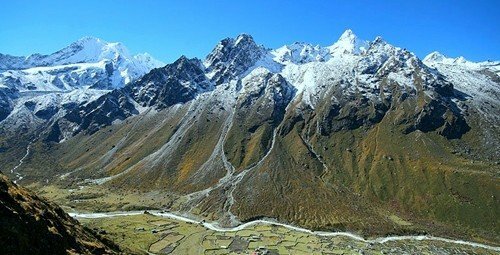 Rolwaling Tashi Lapcha Pass Trek is an amazing mixture of the quiet and quaint paths of the remote Rolwaling region with the bustling trails of the Khumbu region. Rolwaling Tashi Lapcha Pass Trek involves steep climbing, lots of patience, and rock climbing, thus, is a thrilling and adventurous journey in the Himalayas. Rolwaling valley is one of the hidden gorges, which is burrowed in between picturesque and grandiose mountains. 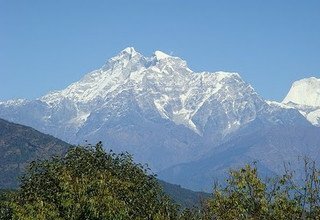 Rolwaling Tashi Lapcha Pass Trek begins with a drive to Gonggar via Dolakha from where we pass villages like Simigaon, Bedding, and Na Gaon with an amazing view of Mount Gaurishankar (7134m). 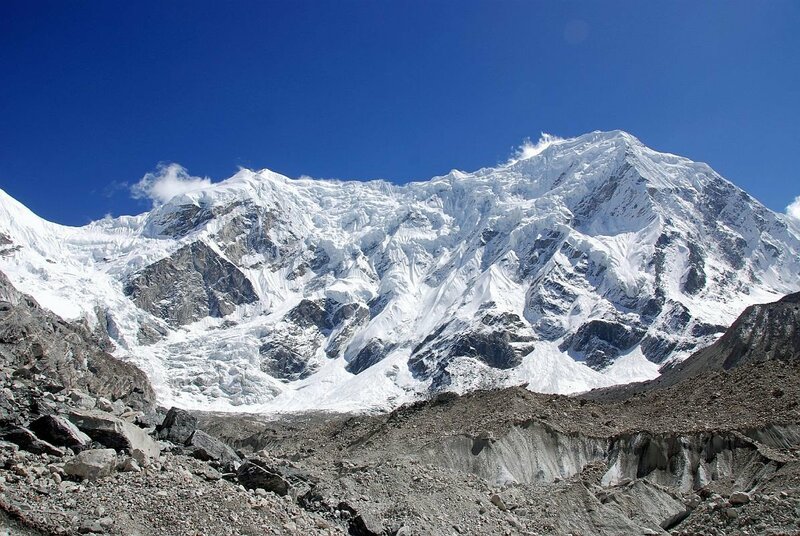 In Na Gaon, we explore the Yalung Glacier and climb on the training peak of Ramdung Go (5930m). Leaving Na Gaon, we climb uphill to Tsho Rolpa Lake (4540m), the largest glacial Lake in Nepal. 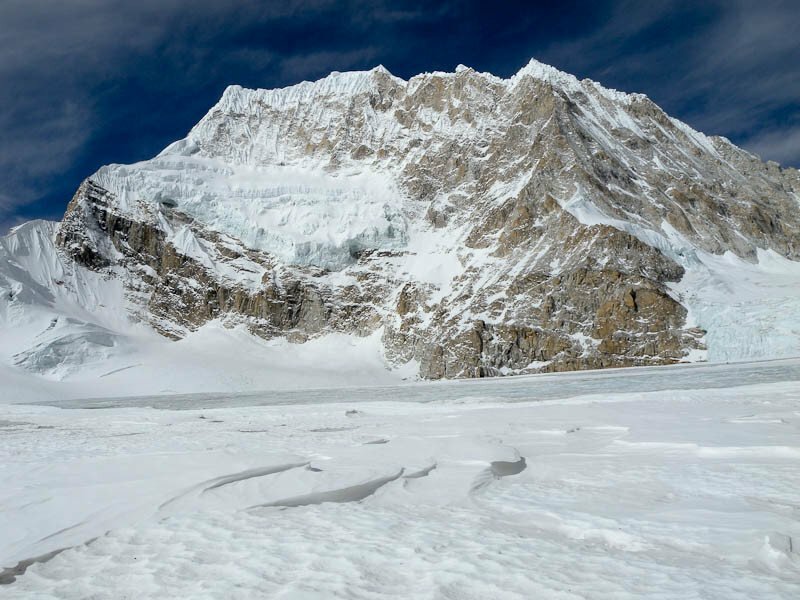 Then, waking on slippery glaciers, the trail reaches Tashi Lapcha Pass (5755m), which separates the Rolwaling region from the Khumbu region and the Gaurishankar Conservation Area from the Sagarmatha National Park. 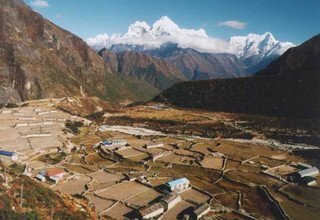 The trail then joins the trekking trails of the Khumbu region which is ever bustling with tourists from inside and outside the country. Enjoying the view of Everest (8848m), Cho Oyu (8201m), and other mountain peaks of the Khumbu region, the trail heads down to the bustling Sherpa town of Namche Bazaar via Thame and leads to Lukla, from where a flight back to Kathmandu is taken. Rolwaling Tashi Lapcha Pass Trek is an amazing opportunity to observe the different facets of the Himalayan lifestyle as it goes from a remote to a rather urban route of the Himalayas. 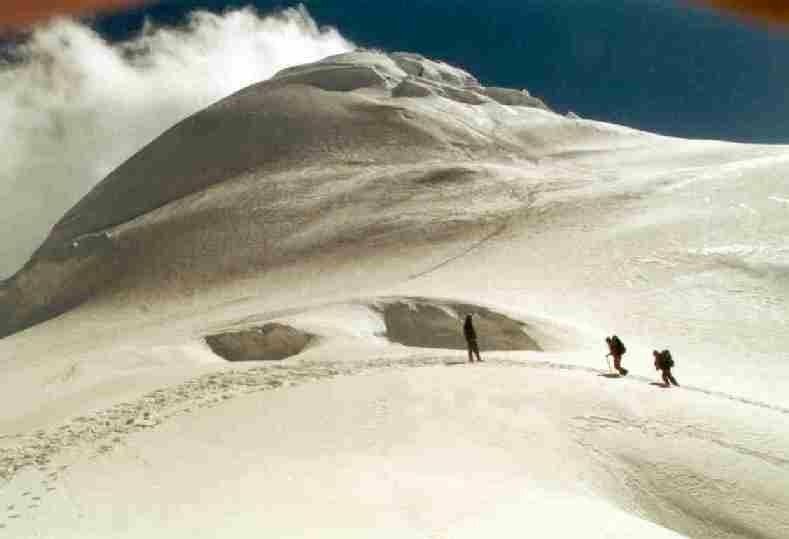 Swiss Family Treks and Expedition believes in minimizing the challenges of trekking for our clients. We acquire all of your permits and assign you an English speaking guide of the local region so that your navigation is easier and efficient. 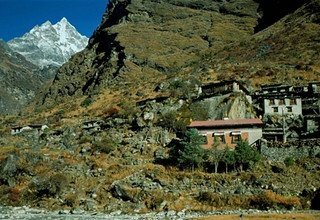 For this camping trek, a team of porters and cook accompany you throughout the trek and make sure your trek is comfortable. We provide you with a private land cruiser for all off-road drives. Please note that the domestic flights are subject to the delay as the weather of the Himalayas is not quite predictable. 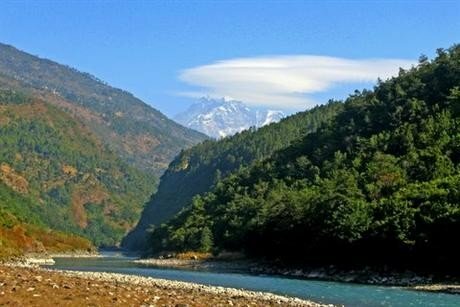 Major attraction: Unspoiled mountain scenery including Gaurishankar and Everest Range, beautiful Tsho Rolpa Lake, Nunnery Gompa and other ancient monasteries, breathtaking landscapes, pristine Glaciers, high and challenge pass, unique Tibetan culture and tradition of peoples and their way of life. Welcome to Nepal. Our representatives will be waiting for you at Tribhuvan International Airport, Kathmandu. They will pick you up and drop you at your hotel. Enjoy the evening strolling around the nearby market. Overnight at a 3-star hotel in Kathmandu. After breakfast, we drive to Gonggar via Dolakha. Along the way, we can encounter the views of Sunkoshi and Bhote Khosi rivers. 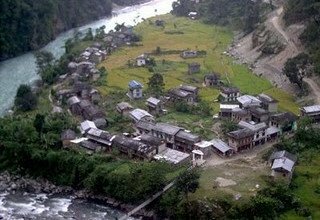 Driving past Dolakha, Pikhuti, Suri Dobhan, and Manthali alongside Tama Koshi River, we arrive in Gonggar. 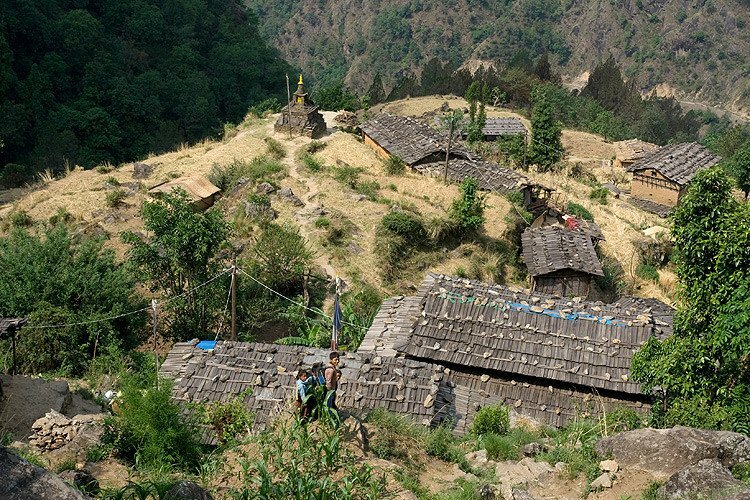 From Gonggar, we trek past a Sherpa village through the rhododendron forest to reach Simigaon. 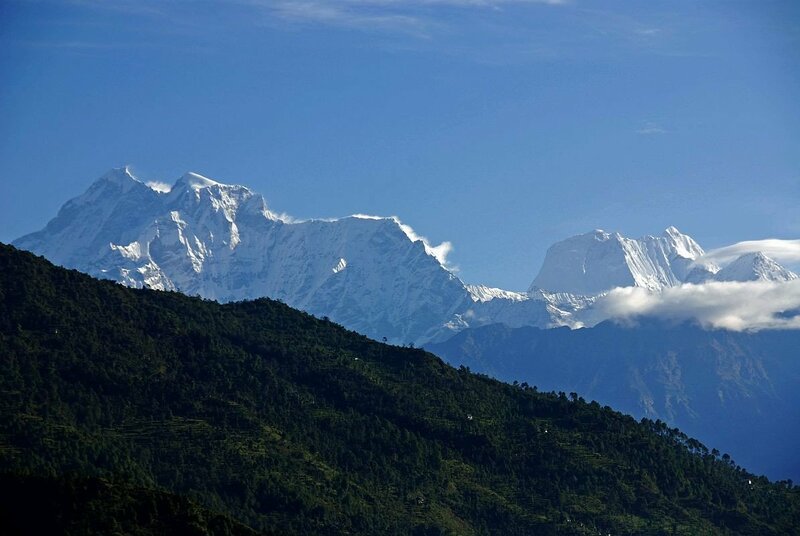 We will have an alluring panorama of Mount Gaurishankar (7134m) from Simigaon. Overnight in Simigaon. Descend downhill to a steep trail and go around the edge by climbing the vertical stone steps. Enter the rhododendron forest and walk through the trail to reach the Rolwaling River. 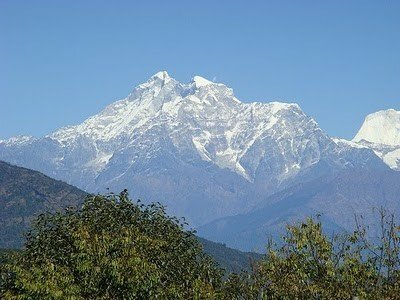 Then, climb uphill through the forest along with the view of Mount Gaurishankar (7134m). Ascend uphill till the trail becomes flat and smooth to reach Daldung-La. Overnight at tented camp. The trail walks through lush rhododendron forest with ascents and descents until reaching Nyamare village. 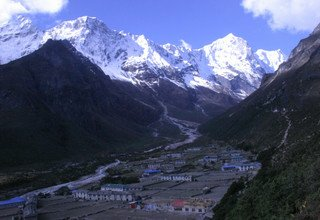 Then with a panoramic view of Mount Gaurishankar (7134m), we walk to Beding, the largest Sherpa village of Rolwaling region. 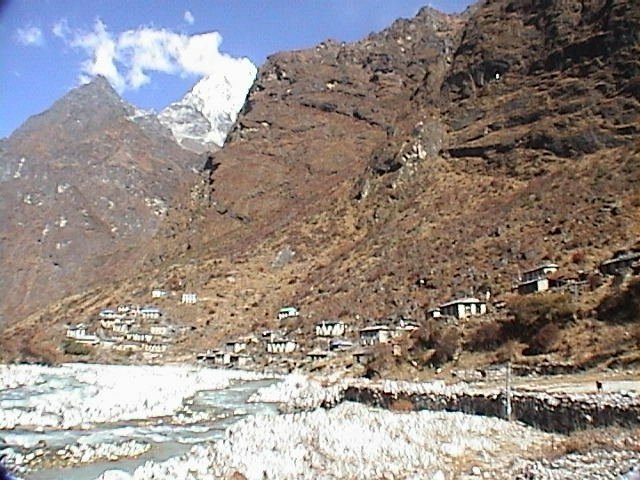 There is a Gompa at the entry of the village and the holy Gaurishankar Temple a little above the village. Overnight at tented camp. Today is a day set apart for acclimatization. We can either rest or go for the short excursion. We hike up to Menlung La Pass (5616m) walking on the moraines. 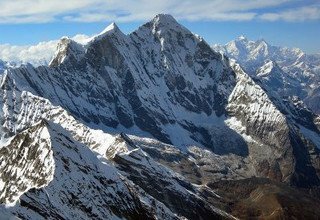 From the top of Menlung La, a remarkable view of snowy mountains including the holy Mount Gaurishankar (7134m), glaciers, and the lush forest in the Beding valley can be seen. Overnight at tented camp. After breakfast, we start by a slow ascend on the bank of Rolwaling River until we reach Dhogre. 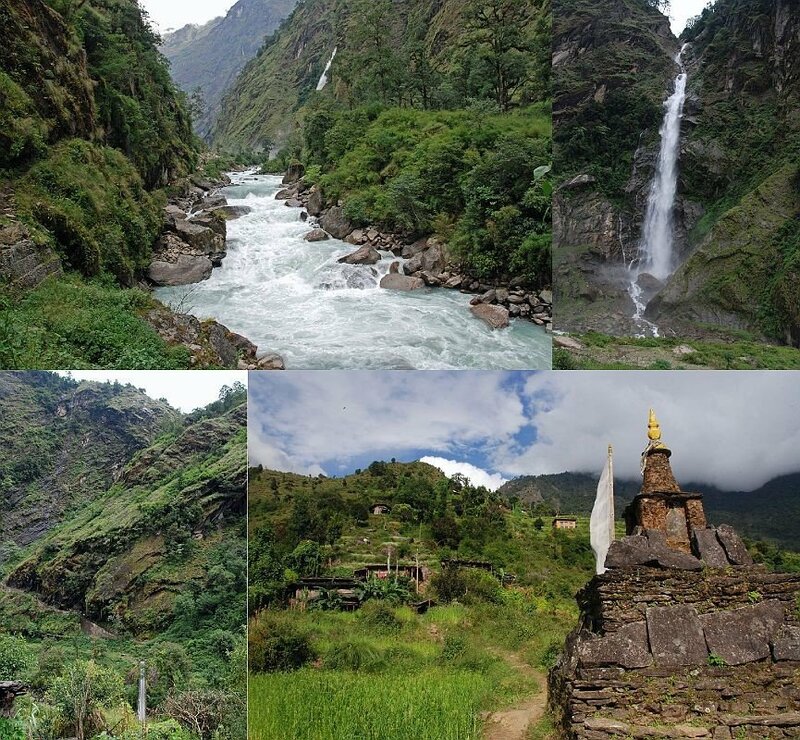 After walking further, the valley slowly opens to a huge Mani stone wrapped with prayer flags and a large rock with an image of Bodhisattva painted on it. 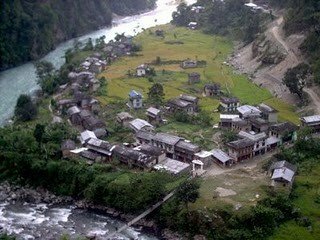 Finally, we reach Na Gaon situated on the bank of the Rolwaling River. Overnight at tented camp. We take another day for acclimatization. We walk through the icy and slippery trail of Yalung Glacier and later Ramdung Glacier to reach Ramdung Go (5930m), which is an excellent training peak for mountain climbing. An amazing view of Tsho Rolpa Lake and the surrounding glaciers, as well as mountains, can be seen from the top of Ramdung Go. We then hike back to Na Gaon for the overnight stay. After breakfast, we leave Na Gaon and cross the wooden bridge over the Rolwaling River. We move on somewhat steep trail uphill. We trek on the moraines of Rolwaling Glacier to reach the majestic glacial lake. 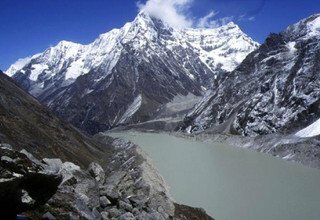 Tsho Rolpa Lake is the biggest and one of the most popular lakes in Nepal that is situated at the altitude of 4540m. The deep blue lake hosts an amazing reflection of the surrounding hills and snowy-peaks as it envelops the vicinity in tranquility. Overnight at tented camp. Although short, distance-wise, the trek will be tough today as we are required to walk through the icy and challenging trail of Trakarding Glacier throughout the day. 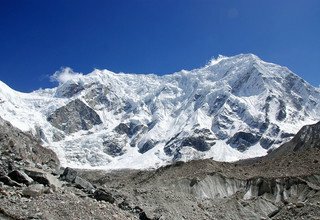 With a view of several mountains like Rolwaling Kang (6664m), Takargo (6671m), and Jabou Ri (6166m) among others, we climb on a rocky terrain to reach Trakarding. Overnight at tented camp. The trail goes uphill through some rock climbing and a slow walk on the glacier. We now leave the trail of Trakarding Glacier and walk through Drolambau Glacier. This will be a difficult day because we walk on slippery trails. The scenic beauty will be amazing to experience as we will be seeing snow all around us. 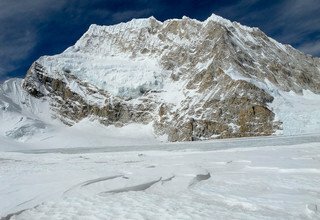 Walking on Drolambau Glacier, we arrive in Tashi Labcha Phedi. Stay overnight at camp. Day 11: Trek from Tashi Labcha Phedi to Tashi Camp 5200m (6/7 hours) via Tashi Lapcha Pass 5755m. Steep climb from Tashi Labcha Phedi to Tashi Lapcha Pass (5755m) will lead us to Tashi Labcha Camp (5665m), which is also known as Tashi Labcha Phuk. After a hard climb, we reach the top of Tashi Labcha Pass (5755m), which separates Rolwaling region from Khumbu region. We now enter Sagarmatha National Park and descend for a short time to reach Tashi Lapcha Camp. Stay overnight at camp. Today, we will be experiencing relatively easier glacier walking as the trails are smooth and downhill. Descending from Tashi Labcha Camp, we arrive in Ngole, whose trail is full of snow and ice. 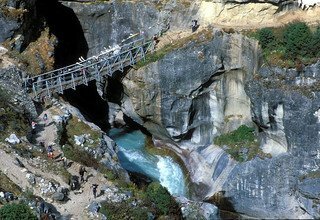 Then we descend on the trail to reach Parchemuche Tsho, a glacial lake in the Khumbu region, en route to Thyangbo. With a view of Pasang Lhamu Chuli (7350m and Cho Oyu (8201m), we arrive in Thyangbo. Stay overnight at tented camp. 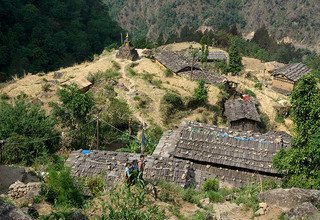 Early morning, we walk through yak pastureland and arrive at the yak herder's temporary huts. This trail is bumpy and slowly goes downhill. We will follow a small stream throughout the way as we relish the beauty and calmness of the environment. We arrive at the Power House before entering the village of Thame. 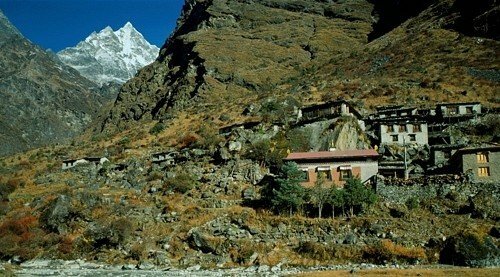 In the evening, we will visit the Thame Monastery and enjoy the beautiful view of the surrounding mountains. Stay overnight at tented camp. The trail descends slowly to Samde. 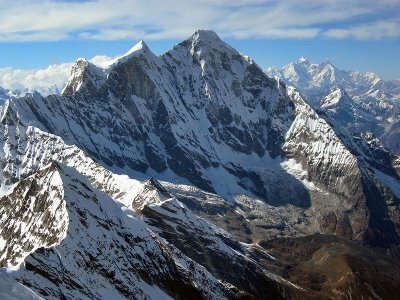 Get the sights of great peaks of the Khumbu including Mt Everest (8848m), Cho Oyu (8201m), Taboche (6367m), and other peaks of Khumbu region. 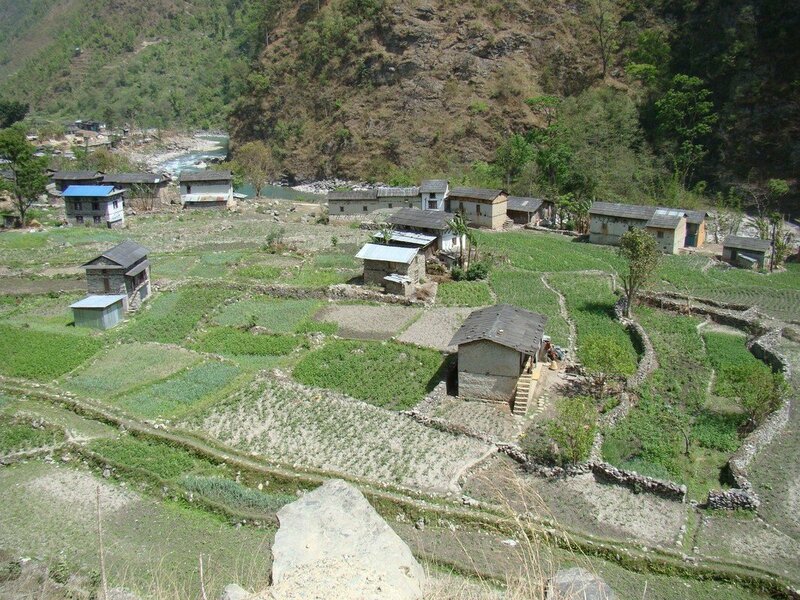 Crossing several villages and monasteries, the trail descends to Syangboche before reaching Namche Bazaar. 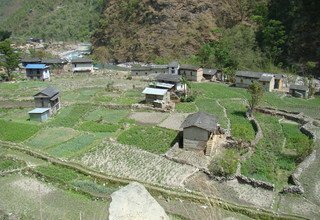 Then, following the trails of Bhote Koshi River, we arrive in the commercial hub of Namche Bazaar. The Sherpa town is vibrant with tourists from all around the world. Overnight in Namche Bazaar. 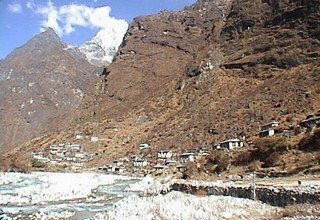 Leaving behind Namche Bazaar, we trek with Bhote Koshi River and Dudh Koshi River on our every side. 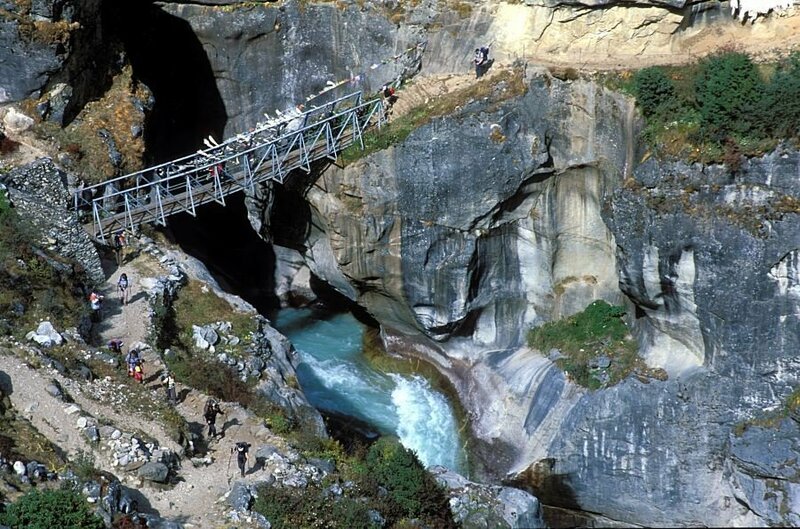 Reaching the confluence of these two rivers at Larja Dobhan, we descend to Jorsalle and exit Sagarmatha National Park. 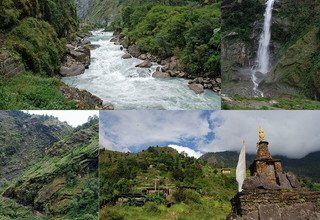 Then, we trek alongside Dudh Koshi River as we cross many villages, monasteries, Mani walls, and prayer wheels to arrive in Lukla. Overnight at tented camp. Day 16: Fly from Lukla to Kathmandu and transfer to Hotel. We take an early flight from Lukla to Kathmandu (40 minutes) over the spectacular mountain peaks. On arrival, you will be taken to the hotel so that you can rest and freshen up. Later, you can wander around the streets of Kathmandu and do some shopping for your loved ones back home. Feel free to get the taste of local food and lovely ambiance of Kathmandu. Overnight at a 3-star hotel in Kathmandu. Day 17: Reserve day for flight cancellation from Lukla to Kathmandu due to bad weather, Overnight in Hotel. In case your flight gets delayed or canceled from Lukla, you can extend this one day on your trip. The cancellation can be due to bad weather. You can explore the place and try to get along with the locals. You can meet the local people and hear different stories from them. Try their traditional food and enjoy the day along with the amazing surrounding. Day 18: Departure to International Airport. Farewell. We will drop you at Tribhuvan International Airport 3 hours before your flight time. We hope to see you again! * Domestic flight ticket Lukla/KTM and domestic airport tax. * 3 nights accommodation with breakfast at 3* hotel in Kathmandu. * All transportation by private 4W land cruiser. * All Camping equipment (Tents) and Kitchen equipment. * Gaurisankar Conservation Area Permit. 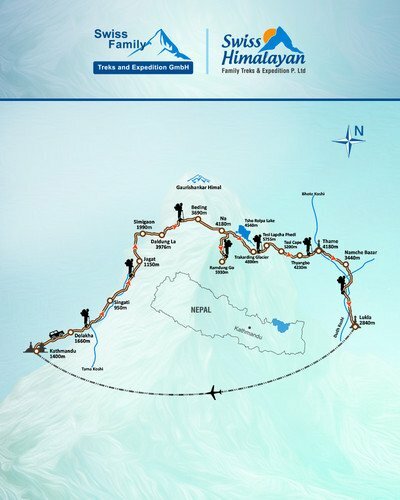 * Sagarmatha National Park permit and all necessary permits. * Climbing Sherpa and his equipment.